Researchers tissue-engineered human pancreatic islets in a laboratory that develop a circulatory system, secrete hormones like insulin and successfully treat sudden-onset type 1 diabetes in transplanted mice. In a study published by Cell Reports, the scientists use a new bioengineering process they developed called a self-condensation cell culture. The technology helps nudge medical science closer to one day growing human organ tissues from a person's own cells for regenerative therapy, say study investigators at Cincinnati Children's Hospital Medical Center in the U.S. and Yokohama City University (YCU) in Japan. "This method may serve as a principal curative strategy for treating type 1 diabetes, of which there are 79,000 new diagnoses per year," said Takanori Takebe, MD, a physician-scientist at the Cincinnati Children's Center for Stem Cell and Organoid Medicine. "This is a life-threatening disease that never goes away, so developing effective and possibly permanent therapeutic approaches would help millions of children and adults around the world." Takebe, who has a dual appointment in the Department of Regenerative Medicine at YCU, stressed the technology needs additional research before it can be used therapeutically in a clinic. He is the study's co-lead investigator along with YCU colleague, Hideki Taniguchi, MD, PhD. Scientists tested their processing system with donated human organ cells (pancreas, heart, brain, etc. ), with mouse organ cells and with induced pluripotent stem cells (iPS). Reprogrammed from a person's adult cells (like skin cells), iPS cells act like embryonic cells and can form any tissue type in the body. The tissue-engineering process also uses two types of embryonic-stage progenitor cells, which support formation of the body and its specific organs. The progenitor cells are mesenchymal stem cells (MSNs) and human umbilical vascular endothelial cells (HUVECs). Using either donated organ cells, mouse cells or iPS cells, the researchers combined these with MSNs, HUVECs along with other genetic and biochemical material that cue the formation of pancreatic islets. In conditions that nourish and nurture the cells, the ingredients condensed and self-organized into pancreatic islets. 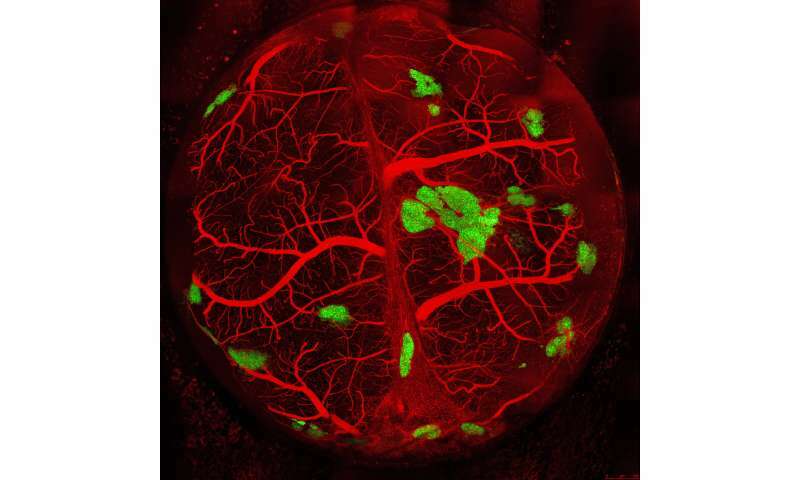 After the tissue-engineered islets were transplanted into humanized mouse models of severe type 1 diabetes, they resolved the animals' disease, report researchers. Human pancreatic islets already can be transplanted into diabetic patients for treatment. Unfortunately, the engraftment success rate is relatively low because the tissues lose their vascularization and blood supply as islets are being processed before transplant. This makes it difficult to get the maximum health benefit for patients getting these procedures, the authors write. "We need a strategy that ensures successful engraftment through the timely development of vascular networks," said Taniguchi. "We demonstrate in this study that the self-condensation cell culturing system promotes tissue vascularization." Pancreatic islets tissue-engineered in the current generated by the process not only quickly developed a vascular network after transplant into animal models of type 1 diabetes, the tissues also functioned efficiently as part of the endocrine system—secreting hormones like insulin and stabilizing glycemic control in the animals. Takebe's and Taniguchi's research team already demonstrated the ability to use a "self-condensation" cell culture process using iPS cells to tissue engineer three-dimensional human liver organoids that can vascularize after transplant into laboratory mice. But the ability to generate organ tissue fragments that vascularize in the body—like pancreatic islets—had been an elusive goal until the current study, investigators said.